With Ericom, you can extend the reach of your investment in Microsoft's connection broker while taking advantage of the latest cutting edge HTML5 technology. Deliver 100% browser-based access to Windows desktops and applications published using the Microsoft Windows Remote Desktop Connection Broker (RDCB), from any device, anywhere — NO software installation or plug-ins are required on the end-user device! 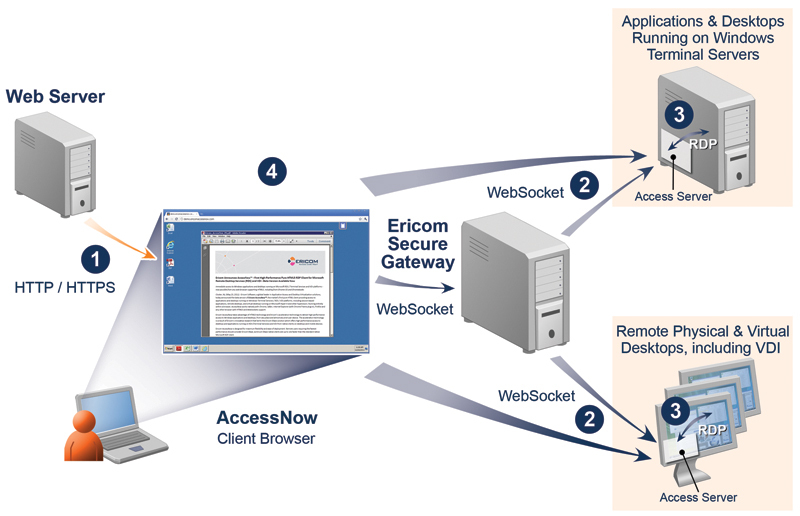 Ericom AccessNow™ for RDCB enables Windows Servers running RDCB to deliver on-demand access to Windows applications and desktops, from any HTML5-enabled device supporting the WebSocket protocol. This includes Windows PCs, Linux and Mac devices, iPad / iPhone, Android, BlackBerry, Chromebooks / Chromeboxes and locked down devices. The combination of Ericom AccessNow and Windows Server Remote Desktop Services increases deployment flexibility while improving remote worker efficiency.